Debris from Fine Swine is piled up in front of the restaurant on Tatum Street. Firefighters from various local and area departments had the fire at Fine Swine Bar-B-Que back under control this afternoon. 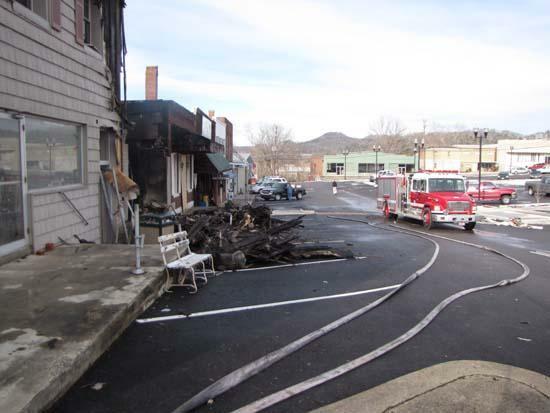 The third flare-up of the blaze resulted in the restaurant being completely gutted. Double brick walls on both sides prevented the fire from spreading to adjacent buildings. Smoke damage was reported at Joe's Place, but owner Randy Barrett said the eatery would be back open Saturday morning. Firefigthers planned to keep watch on the situation at Fine Swine well into the evening in the event the fire flared up again. For the first time since early this morning, no smoke was observed coming from the ruins at 3:30 p.m.
No interior fire damage was reported at any other nearby structures, including Woodson's Pharmacy. Can't they stop the fire the FIRST time!!!! too many buildings re-ignite when they leave...something is wrong. There are hot spots that will flare back up. hoghito, did you ever try to put out a grease fire with water? It don't happen. They should use the right chemical to stop grease fires....Have family members who are fire fighter and they don't believe this.